The University of Plymouth’s public engagement work to raise awareness of the issue of antimicrobial resistance (AMR) has been shortlisted for a national award. The Antimicrobial Resistance team, comprising academic and professional services staff, post-doctoral researchers, PhD candidates and undergraduate project students, has held a range of events over the past year to highlight the issues surrounding antibiotic resistance and the need to preserve their efficacy for future generations. It has now been shortlisted in the 2018 Antibiotic Guardian Awards, on behalf of Public Health England, in the Public Engagement category. Antibiotic resistance is one of the biggest threats to global human health, and one that carries a cost to society estimated in the trillions of dollars and millions of deaths per year. As bacteria evolve and become resistant to last-line therapies, so the antibiotic arsenal available to health services continues to dwindle in effectiveness. With that as the context, the team supported World Antibiotic Awareness Week in November of last year, which included Dr Upton writing a thought leadership article for the media, interactive lab sessions on beta-lactamase resistance, a screening of the film Resistance with associated Q&A session, and a research poster exhibition. This was followed in January of this year with an AMR event held as part of the University’s Festival of Research, which included interactive sessions where members of the public and school children took swabs of the local environment. These were then analysed in the laboratory as part of the initial stage of antibiotic discovery, and shared with the participants via social media. The University is also developing a portfolio of new events, with supporting material that will be added to and used on future occasions. 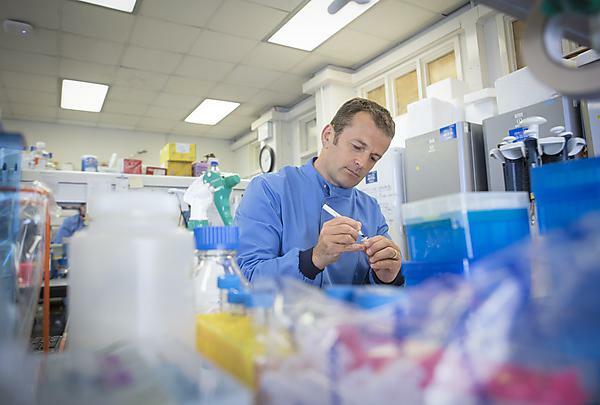 Dr Upton, who is currently engaged in ground-breaking research on the development of the first new class of antibiotic in several decades, will be presenting at the awards night in London in June. A team of scientists from the University of Plymouth are identifying and developing potential new antimicrobials produced by the microbiome of sponges which live deep beneath the ocean surface.